Verity Bloom hasn't been interested in cooking anything more complicated than the perfect fish finger sandwich, ever since she lost her best friend and baking companion two years ago. But an opportunity to help a friend lands her right back in the heart of the kitchen. The Plumberry School of Comfort Food is due to open in a few weeks' time and needs the kind of great ideas that only Verity could cook up. And with new friendships bubbling and a sprinkling of romance in the mix, Verity finally begins to feel like she's home. 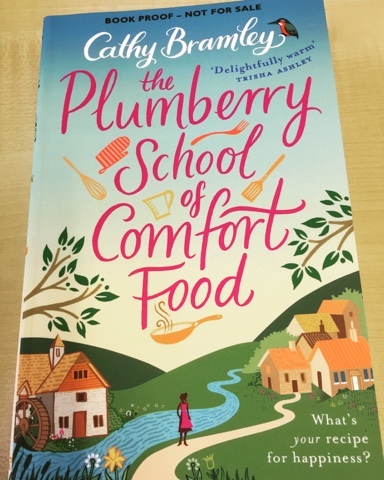 But when tragedy strikes at the very heart of the cookery school, can Verity find the magic ingredient for Plumberry while still writing her own recipe for happines. Review: I have just finished reading the final 2 parts of this story, which has been published as a 4-part e-serial, and thought that I would review it as a whole. I am always excited to see a new offering from the talented Cathy Bramley, and this story was definitely up there with her best. I'm not a great fan of serialised stories as a rule, and am glad to see that the entire story is being released in print and electronic format in a few weeks. I really enjoyed this tale from the start. The concept of the cookery school and its idyllic-sounding setting were both attractive, but I was particularly intrigued to find that the inspiration for the story is a lady who runs not only a cookery school but also a restaurant that I know well in the Lake District. The main character, who I took to straight from the start, is Verity Bloom. She is a lovely, but a little naive, person, who, at the very start, loses her job in marketing and her underhand boyfriend, who was not likeable in any way. However, as luck would have it, Verity's best friend's mother, Gloria, who is starting up a cookery school, needs a little help in the marketing area, and asks Verity if she could step in for a month. Verity always loved cooking with Gloria's daughter, Mimi, but when Mimi died suddenly 2 years previously, Verity's passion for cooking died with her. As well as keeping in touch with Gloria since her friend's death, Verity regularly sees Mimi's husband, Gabe, and young son Noah. There is some kind of mystery there which unfolds as the story goes along. The other major characters we meet in the story are: Tom, a pretty dishy sounding if a little serious, Michelin-star chef who has been engaged to work at the cookery school; Mags, a great friend and neighbour of Gloria's who also works with her; Pixie, an aspiring chef; Verity's housemate Rosie; and two extremely cute dachshunds. As the title of the book suggests, the action takes place primarily in the Yorkshire village of Plumberry, where the cookery school is housed in an old mill, complete with river flowing by and original mill wheel - sounds just lovely. The whole village is very food oriented, with all sorts of specialist shops and even its own small brewery. It's all so well described that I felt I had to go and have a snack after each instalment. Although, as I say, I am not a great fan of serialised stories, the parts are very well presented, each ending on some kind of cliffhanger, leaving the reader desperate to find out what will happen in the next instalment. I really enjoyed watching the relationships developing between the various characters, and to see Verity gradually rediscover her passion for cooking. However, It was not all plain sailing - there were some very sad incidents along the way. A really nice touch is that each instalment ends with a few recipes to try out, including, as it happens, my favourite pudding from that restaurant I mentioned at the beginning of this review. I'm sure that this story will appeal to anyone, and not just those interested in cooking. There is a good, strong story line running through the book. Whether you read it in parts or as a whole, I hope it will pull you in, as it did me. Don't be surprised, though, if you end up a bit peckish; those recipes at the back may just come in handy!